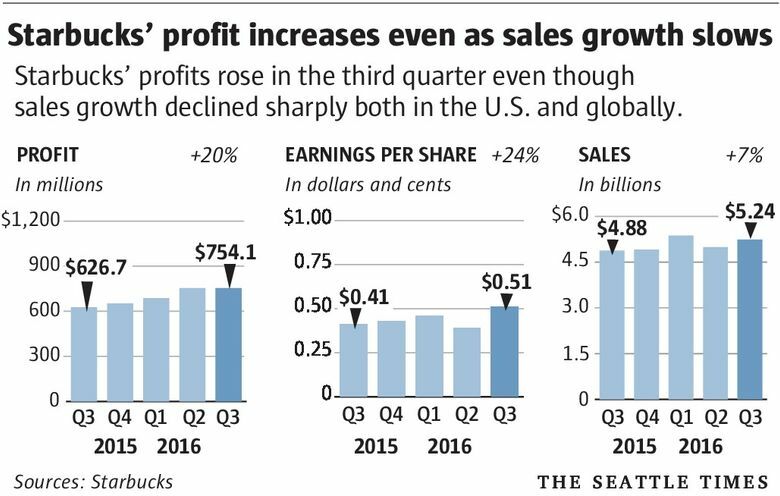 Starbucks’ sales growth, which had been on a tear last year but started showing signs of slowing last quarter, slid even more last quarter. Starbucks executives on Thursday blamed everything from faulty business moves to global uncertainty for what they called “an anomaly” of a quarter in which sales growth slowed sharply both in the U.S. and worldwide. Sales at stores open at least a year grew only 4 percent globally for the quarter ended June 26. That compares with 7 percent growth in the same quarter a year ago, and 6 percent in the previous quarter. Particularly worrisome was the 4 percent growth in the Americas, Starbucks’ largest segment. Last year, comparable sales — meaning sales at stores open at least a year — in the Americas was up 8 percent. Last quarter, it was 7 percent. Company executives blamed lower sales growth in the U.S., which was the main reason for the global sales slowdown, on three factors: the launch of a revamped rewards program in April, which delayed by a week the start of its summer Frappuccino happy-hour program; running simultaneous marketing campaigns for the rewards and Frappuccino programs; and weakening consumer confidence. “In Starbucks’ 24 years of public life, I can’t remember a quarter quite like Q3 of 2016, when a confluence of political and social turmoil at home, weakening consumer confidence, increasing global uncertainty and the launch of one of our most significant long-term initiatives of all times all occurred within a single earnings period,” Howard Schultz, Starbucks’ chairman and CEO, said in a conference call with investors. The Frappuccino happy-hour event, in which the blended drink is sold for half price between 3 and 5 p.m., typically drives a lot of sales, Schultz said. Kevin Johnson, Starbucks’ president and chief operating officer, said having marketing messages about the rewards and Frappuccino happy-hour programs out at the same time hurt sales. “We didn’t get as much traction on social media,” he said. Though comparable sales in China, where Starbucks is expanding rapidly, rose 7 percent for the quarter, in the China Asia Pacific segment, growth was 3 percent, down from 11 percent the previous year and level with last quarter. Despite the slowdown in sales growth, overall sales brought in record third-quarter revenue of $5.24 billion, below the $5.35 billion consensus estimate from Zack’s. Earnings fared better, with profit at $754.1 million. Earnings per share was 51 cents, up from 41 cents the previous year. Excluding certain items, earnings per share was 49 cents, which met the Zack’s consensus estimate of 49 cents, and was up from 42 cents a year ago. Starbucks shares were down about 3 percent, to $57.60, in after-hours trading Thursday after the earnings news. “Starbucks lost momentum in its third quarter,” Neil Saunders, CEO of retail research firm Conlumino, said in an email. Starbucks changed its loyalty program in April to reward customers for the amount of money they spend, rather than frequency of purchases. Some longtime customers were irate at the change, saying it would make it harder to earn rewards. But the company said that, in the third quarter, it had 12.3 million rewards-program members in the U.S., up 18 percent year over year. The vast majority of those members used Starbucks’ mobile app for payments, which accounted for 25 percent of all transactions. The company’s mobile order-and-pay feature, which was launched last spring and allows customers to bypass store lines when placing orders with their devices, accounted for nearly 5 percent of all U.S. transactions. That was up from 4 percent in the previous quarter, the company said. Separate from the earnings results, Starbucks confirmed Thursday that the wage increase for workers it announced last week, due to start in October, means workers won’t get an annual pay bump in January. Starbucks said last week that it would raise the base pay of all employees, including store managers, at its U.S. company-owned stores by 5 percent or more starting Oct. 3. It also is doubling the annual company stock award for employees who reach two years of continuous service. As noted earlier by BuzzFeed, the company typically gives a pay raise in January, but won’t this time. 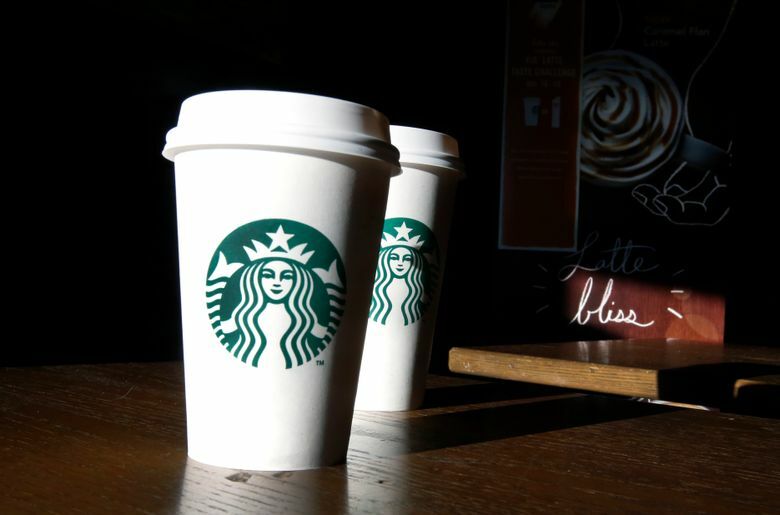 The 5 percent minimum pay raise is greater than the typical January increase, said Jaime Riley, a Starbucks spokeswoman. Riley declined to say what the typical increase is but said that boosting wages in October rather than January gives employees three additional months of higher pay.